Use the buttons below to download the Android and iPhone Apps. As you know, Illinois adopted the 2000 Edition of NFPA 101, Life Safety Code, on January 2, 2002, updating statewide requirements to reflect performance-based codes and more current NFPA standards. This was a major public safety improvement for the state, but more remains to be done. And because Illinois permits municipalities to develop and adopt fire safety regulations, you don’t have to wait for another statewide code adoption effort to move forward assertively. If your jurisdiction has not yet adopted NFPA 25, Standard for the Inspection, Testing, and Maintenance of Water-Based Fire Protection Systems, that’s a good place to start. Referenced in the Life Safety Code in Section 9, this widely used national consensus standard is adopted in 30 states, although not Illinois, and is an important component in your suite of sprinkler system requirements. Sprinkler usage is growing in most properties and many jurisdictions prefer to establish the requirements of NFPA 25 through specific adoption, as opposed to through reference via the Life Safety Code. The first edition of NFPA 25 was issued in 1992 and it is now in its 2015 Edition. The standard addresses minimum requirements for the effective care of water-based fire protection systems, including sprinkler, standpipe and hose, fixed water spray, foam water, and other systems, both land-based and marine. The inspection, testing and maintenance requirements in the standard represent the minimum necessary, allowing leeway for authorities having jurisdiction (AHJ) to require more frequent care as they see fit. NFPA 25 outlines responsibilities of the building owner or operator, detailing specifics for care of varied systems through separate chapters, including those addressing private fire service mains, fire pumps and water storage tanks. Additional chapters deal with Obstruction Investigation and Impairments. Appendices to the standard include explanatory materials, forms and other useful information. If adopted and enforced in your jurisdiction, compliance with NFPA 25 will provide assurance that all the systems in your care remain well maintained and operational. If you haven’t already educated your elected officials about this important standard, now is the time. 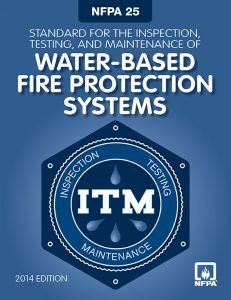 Bringing your jurisdiction a set of requirements to ensure routine testing of water-based fire protection systems is another step toward greater public safety for the people of Illinois, starting with your jurisdiction. www.nfpa.org/Codes/Interpretations/FAQ25/FAQ25.asp. NFPA 25 is available for purchase from NFPA online at www.nfpa.org/catalog ($34.43 member/$38.25 non-member). Also available is the NFPA 25 Handbook ($85.46 member/$94.95 non-member), which combines the complete standard with supplementary text, case studies, reproducible forms and more. NFPA’s investigative report on the One Meridian Plaza fire can also be obtained from NFPA online.